BUTLINCAT's BLOG: John Greenewald - The Black Vault: " Department of Defense GRANTS my SECOND appeal re: the mystery about Mr. Luis Elizondo and AATIP + Art Greenfield: "UFO CHANNEL VIDEO LIBRARY"
John Greenewald - The Black Vault: " Department of Defense GRANTS my SECOND appeal re: the mystery about Mr. Luis Elizondo and AATIP + Art Greenfield: "UFO CHANNEL VIDEO LIBRARY"
In October of 2017, To The Stars Academy of Arts & Science (TTSA) introduced Mr. Luis Elizondo to the world. He claimed he was the head of a “sensitive aerospace threat identification program” which conducted research on unidentified aerial phenomenon. We know it now as the Advanced Aerospace Threat Identification Program or AATIP. I immediately filed a FOIA request to the Office of the Assistant Secretary of Defense (OSD) where Mr. Elizondo worked the day of that press conference. Specifically, Mr. Elizondo was working within the Office for the Under Secretary of Defense for Intelligence (USDI). My FOIA request was given FOIA Case number 18-F-0077 seeking records pertaining to what he claimed to have headed. On November 27, 2017, the DOD responded with a “no records” determination when they searched for records on this program. At the time of filing, the AATIP name was not known, and through additional conversations in December of 2017 when the AATIP story broke in the NY TIMES, Politico etc., OSD claimed all records were under the purview of the Defense Intelligence Agency (DIA). 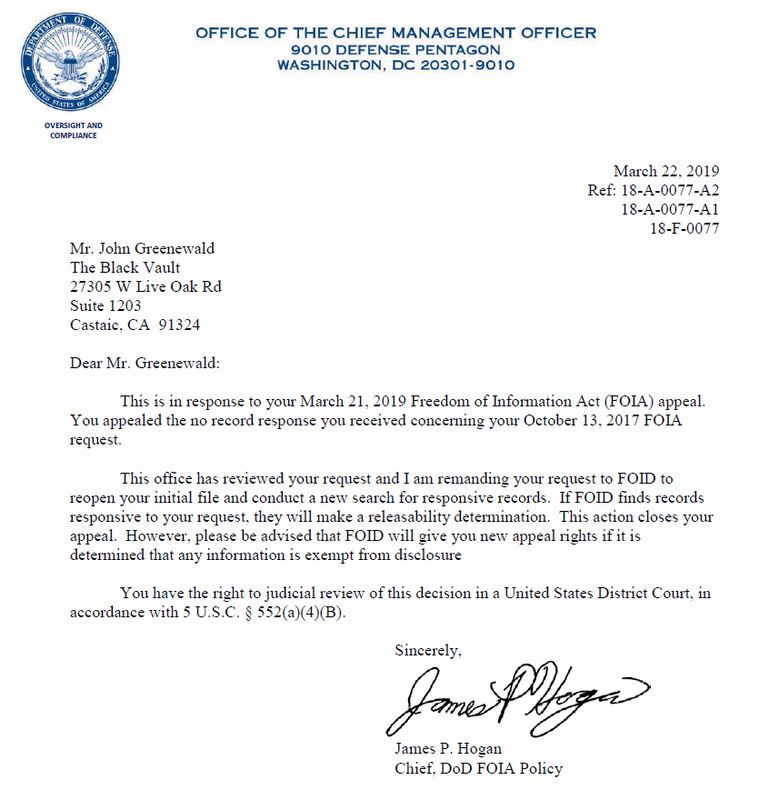 I appealed the “no records” determination to OSD anyway, despite their statements about the DIA, and that was given case number 18-A-0077-A1. In March of 2019, my appeal was GRANTED. (Source) Within TWO DAYS after I received that granted appeal letter (which took well over a year to grant to me), I received a strange response that only deepens the mystery. 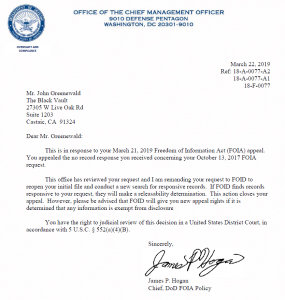 So, in other words, the Department of Defense continues (as of March 2019) to deny claims by Mr. Elizondo that there is any information at their office that proves there was investigation into “unidentified aerial threats” at OSD. 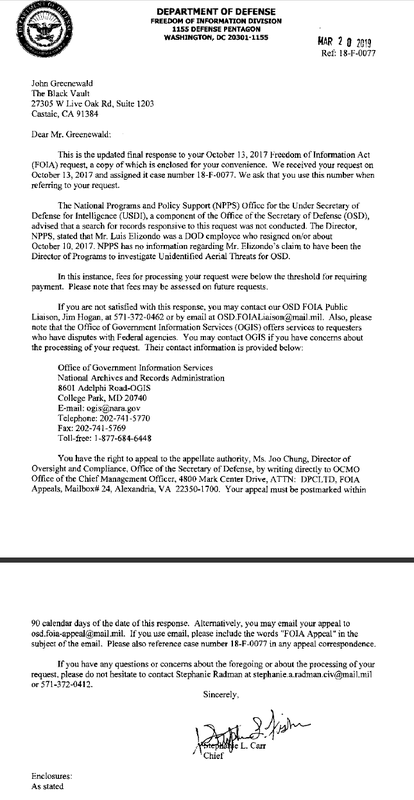 OSD is where Mr. Elizondo worked, and is now confirmed via a FOIA response letter, not just a public affairs office. If you couple that with the recent statements given to me directly by the DIA, wherein they said in 2010 the AATIP program was transferred out of that agency, presumably to OSD, there still seems to be no “unidentified flying object” aspect to the program. Real or not — that continued to be the “official” word. The second appeal to my request — has been officially granted. Another interesting aspect to this letter, is the fact they did not search for records pertaining to my request. As worded, I did not seek “UFO” related records, but rather, “…all documents pertaining to the outline, mission statement, objectives, etc…” We have it confirmed that AATIP was transferred there, so therefore, there should be SOMETHING, UFO related or not, that is responsive to my request. So, I immediately appealed the decision, and was granted the appeal quickly. They are now searching again for records, in hopes that SOMETHING will come out about what AATIP really was. I do not know of any (a/o this post) other AATIP related appeal wins like this at OSD. Further, my recent discovery of documents on Project OUTGROWTHfrom the 1970s proves it is not uncommon for programs like AAWSAP / AATIP to exist, that project technology into the future by 40 years, and that deal with propulsion and aerial technology developments. 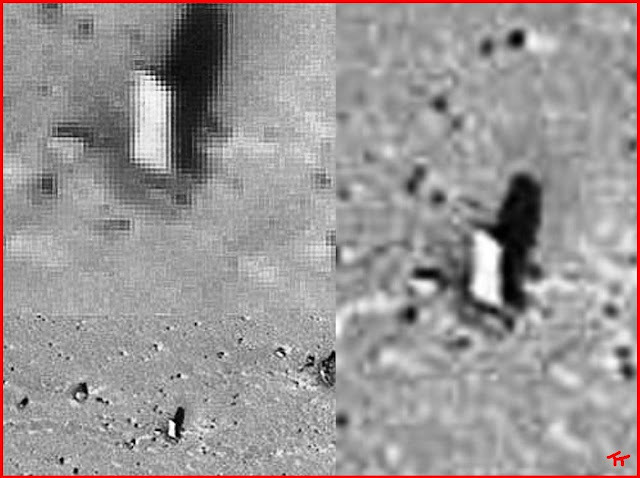 In fact, Project Outgrowth had a nearly identical mission and objective, of course, with some clear differences. But, it went well into the realms of science fiction fantasy, having dealt with “psychic forces” and “psychokinesis.” In other words, non-UFO related programs, dealing with paranormal aspects and advanced technology, have existed before. The concept that AATIP was NOT UFO RELATED is not far-fetched, as history has now proven with undeniable documents obtained via the FOIA. "I've ALSO been sending this out as a package and it is going viral. It has plenty of solid evidence from highly respected sources. Together we can change things for the better. " Ever wanted to have your own video library of TV shows and full length movies about UFOs and the alien agenda? I am posting the list of URLs in Internet groups, of everything in the UFO CHANNEL VIDEO LIBRARY. Now you have this library in your group and you can watch the shows anytime you want. You can even copy the list into your laptop or phone and watch the shows anywhere, even send it to friends so they can see and learn the truth for themselves. Here you can learn the truth about the alien agenda from videos you can watch when and where you want. We are as close as your laptop, desktop, or video capable cell phone 24 hours a day. Videos and TV shows for the public to learn the truth about UFOs, alien abduction, and the reasons for alien interaction with humanity. These videos present the truth and back it up with scientific information and a variety of real evidence. The UFO Channel is dedicated to revealing the truth. To fully grasp the truth you have to look at the Big Picture. The long term interaction of certain aliens with humanity has had far ranging effects on us, both good and bad. We will show what they have done here throughout history right up to the present day. We will explain everything, abduction, cattle mutilation, Roswell UFO crash, war and plague. The purpose of crop circles is anybody's guess. The UFO Channel purpose is to inform everyone about why the beings operating ufos are here, so that we can gain control of our own destiny, and negotiate a mutually beneficial trade agreement with them. This is a reference library containing written information and videos about the different topics associated with aliens interacting with humanity. There is a lot of video information in each section. 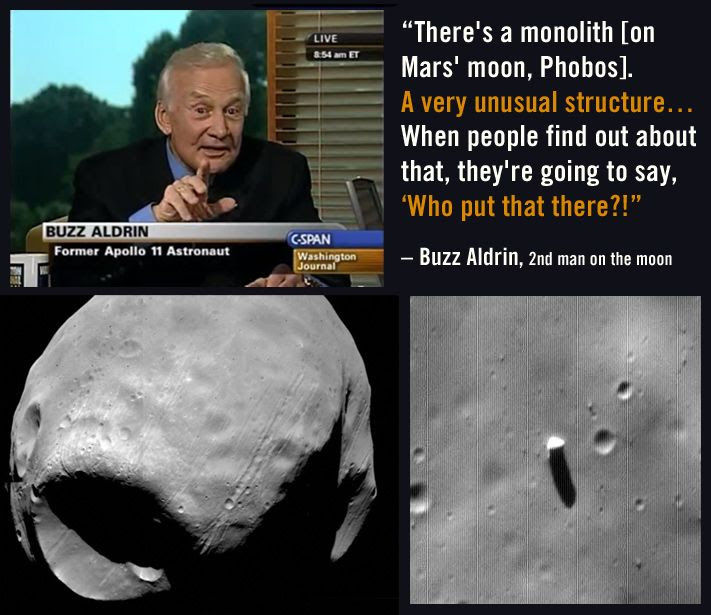 UFOs In The Nasa Archives 2012 Alien UFO Filmhttp://www.youtube.com/watch?feature=player_embedded&v=FkNfNUJl6dI#! Full Length Alien Visitation Movies. Remote Viewing is an innate talent we all have that allows us to mentally see people, places, and events near and far in the past, present, and future. There are sites online where you can learn how to increase your remote viewing skills. You may have noticed over the years that the name of a person or thing may just pop into your mind for no reason, and within a short period of time you will see that thing pop up on TV or in an unexpected phone call. Premonition is done through remote viewing. Physicists who have studied this have shown how it is tied in to quantum entanglement and signal nonlocality, and it is a real phenomena. Some people, like Nostradamus, could see world events on a large scale, hundreds of years in the future. This talent can be useful to you to help you see impending disasters and avoid them, or find lost people, children, or pets. It will also allow you to seek out, watch, and report alien activity here. 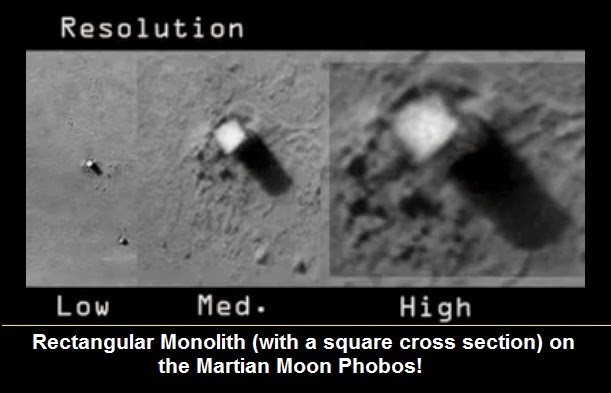 Famed remote viewer Ingo Swann, who worked in the US government RV program, was able to view an underground alien base on the far side of the Moon. He was also able to view exactly where a kidnapped US Army general was being held by radical kidnappers in Italy, and the Italian police were sent in and rescued him. This talent can help us root out malevolent terrorists and aliens before they harm us. AMAZING! - SECRET US ARMY Invisibility Cloak - MUST SEE!!! NYPD tells you, "If you see something, say something." Since I've seen something, I'm saying something. AS YOU CAN SEE, THEY can be standing right next to you and you CAN NOT SEE THEM. They are REALLY good at making sure you can't "see something." Since sniper rifles and other conventional weapons are useless against their advanced technology, new tactics and weapons will be needed by the military and police if the aliens refuse to negotiate a trade agreement and they attack us. Terror assaults on Fox News Channel, BBC, and AFP, like the Paris Charlie attacks will probably happen soon. ISIS has threatened all Twitter personnel. Dozens of news reporters from Al Jazeera are being killed and arrested out there in various Muslim countries to prevent the truth from coming out from that side too. Al Jazeera News was removed from the Dish Satellite basic lineup. All journalists should practice situational awareness at all times for their own safety. Also it is only a matter of time before police stations, DHS, FBI, CIA, and NSA offices become targets for suicide bombers like is done in Iraq and Afghanistan. I've been spreading information about the Big Picture to inform everyone on all sides as to who is really behind these wars, jihads, and mass death. This is no joke or science fiction conspiracy theory. It is deadly serious. Everyone is welcome to help me bring an end to all these wars that are started by outside influences. I recently talked to a Muslim man on Facebook who was skeptical about the existence of UFOs and Repto Sapien aliens. if you are a Muslim you should believe in them because it is in the Quran. Watch these videos put out by the Muslims that show Muhammad was influenced and guided by them. Even today it shows that they are guiding modern Muslim leaders like Elijah Muhammad and Louis Farrakhan, both of whom swear that they were taken up to the mother ship and say they are now completely guided by them. Do you think these famous Muslims are lying? I know they are telling the truth. The Repto Sapiens always "guide" key religious, military, and political leaders of all religions and nations to bring about war to generate dead bodies for the reptilians to harvest. Numbers 21:6 - "And the Lord sent fiery serpents among the people, and they bit the people, and many people of Israel died." The sheeple are now armed and ready to negotiate. NOTICE FOR OUR ALIEN COUSINS AND THEIR ARTIFICIAL INTELLIGENCE COMPUTER. WE WILL SUPPLY YOUR SHIPS WITH FOOD WE PREPARE FOR YOU USING THE SAME IRRADIATION METHODS YOU USE TO PACKAGE FOOD FOR A LONG SHELF LIFE. WE CALL THEM MRES, MEALS READY TO EAT. Watch these videos. We will supply Meals Ready To Eat in bulk in exchange for advanced technology trade goods, ground vehicles, aircraft and spacecraft. Here is some additional background information. If you have any questions, please ask. UFOs are not all flown by true extraterrestrials, the majority of them are owned and operated by our advanced Repto Sapien cousins, who share the Earth with us as their ancestral home world. They are historically cited in about 80 places in the Bible, being described as a SERPENT THAT WALKS UPRIGHT ON TWO LEGS AND IS AS TALL AS A CAMEL (8 FEET TALL). There are statues and temple paintings of them in nearly every ancient society. This has nothing to do with "religious beliefs." It is a proven historical and archaeological fact. That's why I wrote a book showing all of the real world evidence.